Explained: Are The Centre's Claims Over Fugitive Economic Offenders' Bill Valid? The Fugitive Economic Offenders Bill, cleared by the Union Cabinet, on March 1, provides for measures to deter economic offenders from evading the process of Indian law by remaining outside the jurisdiction of Indian courts, thereby preserving the sanctity of the rule of law in India. Although the draft Bill has been in circulation since last year, its revival by the Cabinet, signifies its urgency, in the wake of the refusal of high-profile businessmen like Nirav Modi and Vijay Mallya, to return to India, to face prosecution for their omissions and commissions. LiveLaw answers questions which the readers may have on the Bill, and its implications. Q: Is there currently a legal vacuum to try economic offenders, fleeing the country, before they are apprehended? A: Well, there is no dearth of laws currently.We have the Securitisation and Reconstruction of Financial Assets and Enforcement of Security Interest Act, 2002 (SARFESI), Recovery of Debts Due to Banks and Financial Institutions Act (RDDBFI), Insolvency and Bankruptcy Code and Prevention of Money Laundering Act (PMLA). Section 19 of the FEOB says that the provisions of this Act will override anything inconsistent in any other law in force. It will require a comparison of these laws to see whether there is any inconsistency between them and the FEOB. Neither the Centre nor any expert has so far pointed out any such inconsistency. Q: There is a criticism that the Centre has approved the new law just to divert attention. Is this criticism valid? A: To some extent, yes. The Centre has not revealed what legislative vacuum FEOB seeks to fill. The cases where the total value involved in such offences is Rs.100 crore or more will come under the purview of the Bill, it is claimed. Then, there is a list of scheduled offences under FEOB, which one can assume, were already covered by previous laws. Thirdly, a special forum to be created for expeditious confiscation of the proceeds of crime, in India or abroad, it is hoped, would coerce the fugitive to return to India to submit to the jurisdiction of Courts in India to face the law in respect of scheduled offences. 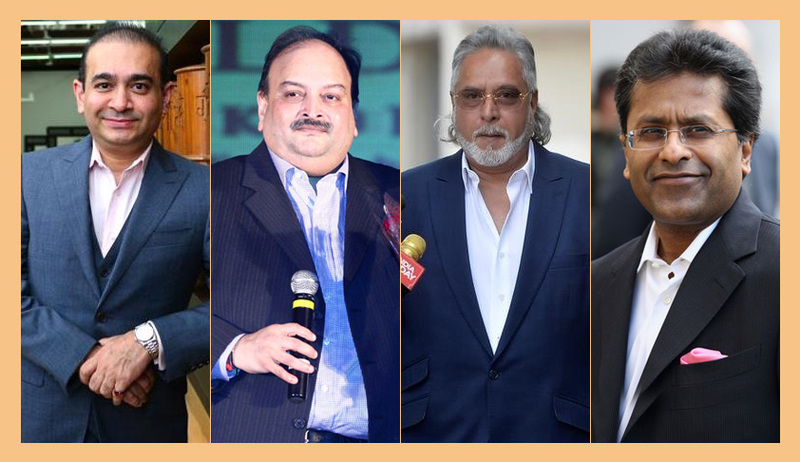 To assume that Vijay Mallya or Nirav Modi are refusing to return to India, taking advantage of the absence of such a special forum, smacks of naivety. Since FEOB has retrospective application, can we expect the Mallyas and Modis to return, because of its deterrent effect? If they don’t, can we conclude that the new law has failed to achieve its objective? Special Courts’ orders are appealable in high courts within 30 days, and in appellate courts, cases can drag on. Q: The Bill’s scope is limited to only those cases where the total value involved in such offences, is 100 crore rupees or more. Will this classification stand legal scrutiny? A: Any classification should have a rational nexus with the object sought to be achieved. Therefore, to discriminate economic offenders, and subject only those crossing Rs.100 crore barrier, to harsh penal laws, is not entirely convincing. Why Rs.100 crore? How was this figure arrived at? What is the justification to say that only if the value exceeds Rs.100 crore, such economic offenders should face action under the law, and not otherwise? The Centre justifies this saying it is to ensure that Courts are not over-burdened with such cases. But this is not entirely convincing. Supposing if the value touches only Rs.99.99 crores, then does the Centre agree that existing laws are sufficient to deal with such offenders? Does not the answer lie in strengthening the existing legal regime, rather than bring in fresh legislation, to deal with a non-existent lacuna? Q: Does not the Centre offer any reasons for the new law? A: It does. First, it says the economic offenders are currently able to evade the jurisdiction of Indian courts, by anticipating the commencement, or during the pendency, of criminal proceedings. It is not clear how the FEOB can help to prevent such anticipation by them. There is no single provision in FEOB, which plugs the loophole in the existing legal regime, to prevent such anticipation. Q: Will not FEOB have deterrent value? A: Its deterrent value can only be determined in practice. The Centre has not so far explained how the existing civil and criminal provisions in law are not entirely adequate to deal with the severity of the problem, or how the FEOB can be an effective, expeditious and constitutionally permissible deterrent to ensure that such actions are curbed. Q: The Centre has cited the U.N.Convention against Corruption, ratified by India in 2011, as a justification for FEOB. A: The non-conviction-based asset confiscation for corruption-related cases is enabled under this UN Convention. Mere adoption of this principle by the FEOB does not free it from other flaws. For instance, Section 10 (2) (a) of the Bill says that the Special Court, to be set up, may order that the proceeds of crime, whether or not such property is owned by the fugitive economic offender, stand confiscated to the Centre. Section 10 (5) shifts the onus of proof on the person other than the fugitive economic offender to show that the interest in such property was acquired without knowledge of the fact that the property was a proceed of crime. This appears too draconian, on the face of it. Q: If an economic offender has assets spread across the world, through a web of holding companies, registered in tax havens, can the FEOB tackle it? A: The FEOB is silent on it, which makes it clear that it cannot help to lift the corporate veil in such circumstances. Q: Section 11 of the FEOB allows any court, in its discretion, to disentitle a declared fugitive economic offender to bring forth or defend any civil claims in any civil proceedings. Does it not violate the basic principles of natural justice? A: It appears so. If challenged, it could be vulnerable to be struck down as unconstitutional.